One decade ago, this tea was being produced, for example. That particular summer was an especially interesting one, as far as I'm concerned, because it was then that I went to the "Neural Computing Applications Forum" and met a pretty girl whom I married one year later. So, to go back to reminiscences of that summer is very welcome. Whom should we thank for taking us back to that summer? Jakub was the kindly provider. My only previous encounter with the 2004 7542 was during a mammoth 7542fest, with Apache, in which we attempted to drink our way through as many different years of 7542 as we could manage. 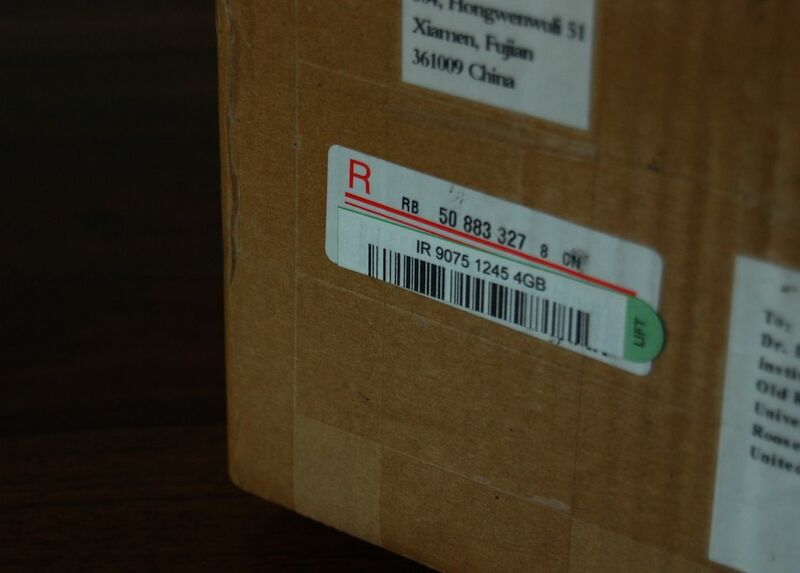 The 2004 example from that experiment was stored in Hong Kong until 2009, and was excellent. 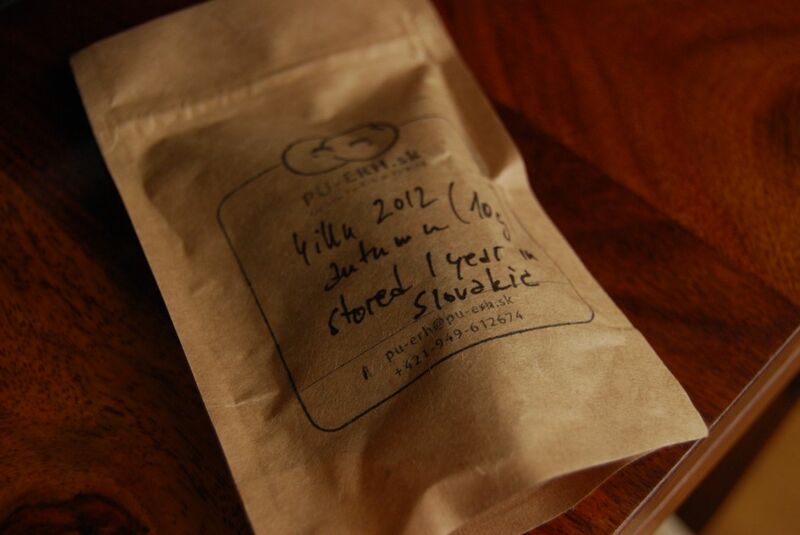 This example, from Jakub (which may have come from Finepuer or Sampletea, as the label suggests in the first photograph for this article), is clean and red, with a fresh scent that suggests minimally damp environments. This session was most definitely "a game of two halves". The first took place in the midst of absolute chaos. I unwisely started a session while visiting family members began to kick up the mandatory fuss that accompanies such a visit. The tea didn't get a very fair roll of the dice. Later, in the quiet aftermath, I fired up the kettle for a second time - and was extremely well-rewarded. The dark red-orange soup of the tea, pictured above, was reborn. The thrill of dense, sweet 7542 is not an exalted pleasure: rather, 7542 is strong and uncomplicated. When the house became quiet, and the visitors and children had resumed their normal states, the 7542 began to shine. I am always impressed by the sheer longevity of well-stored 7542; it seems robust to so many variables that would otherwise damage other teas. It is like the boxer that just keeps on getting up, no matter how many times he is floored. You have to admire the endurance and stamina of a tea like this. In body, it remains thick; in kuwei [good bitterness], it remains challenging; in sweetness, it remains consistent. It's not going to win a beauty contest, but it cannot be evaluated according to those metrics. The 7542 is its own beast, and is entirely uninterested in your opinion of it. That's something we have to appreciate. In a recent plunge into my archives, I found a sample of 2004 "Jin Damo" from TG, a teachum from my native lands, East Anglia. 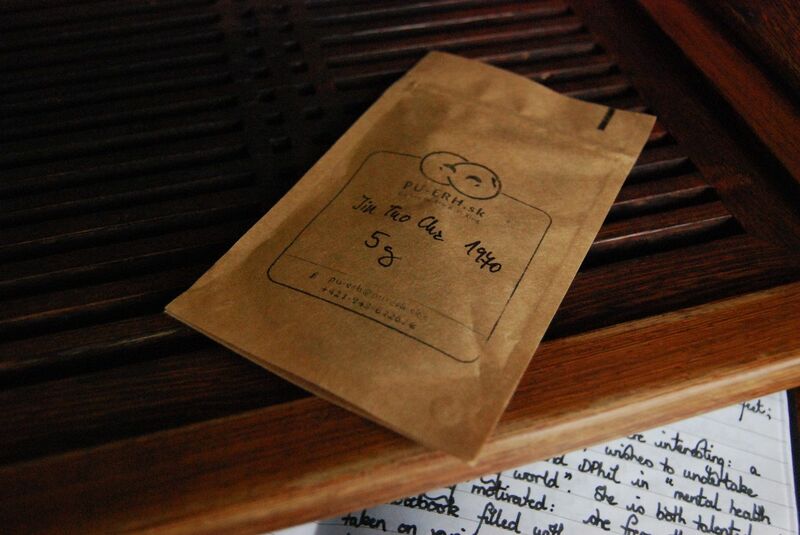 This tea is, I think, from Postcard Teas, a most enjoyable London shop that I visited before. From the latter article, you might see that I own a cake of 2005 "Jin Damo". Amusingly, I have absolutely no idea where it might be. "Damo" is the Chinese name for Daruma / Bodhidharma, the monk responsible for bringing Zen (Chan) out of India, to China, and who is therefore known as the "first patriarch". "Jin Damo", then, is Golden Daruma! Such was the reputation of Daruma that the poor old second patriarch, Huike, allegedly had to cut off his arms before the master took his request for Zen tuition seriously. Among other legends associated with Daruma, one includes the master cutting off his own eyelids to prevent himself falling asleep in zazen (meditation). Subsequent layers of accreted legend have it that the eyelids, on hitting the floor, turned into tea plants. Tasty. If I ever make a tea, it'll be called "Damo's Eyelids". Comedy legends aside, this tea is attributed to the "Liu family" by Postcard Teas, which has later become an attribution to "Master Liu". You simply cannot be taken seriously in the business of selling tea, it seems, unless you are a "master". 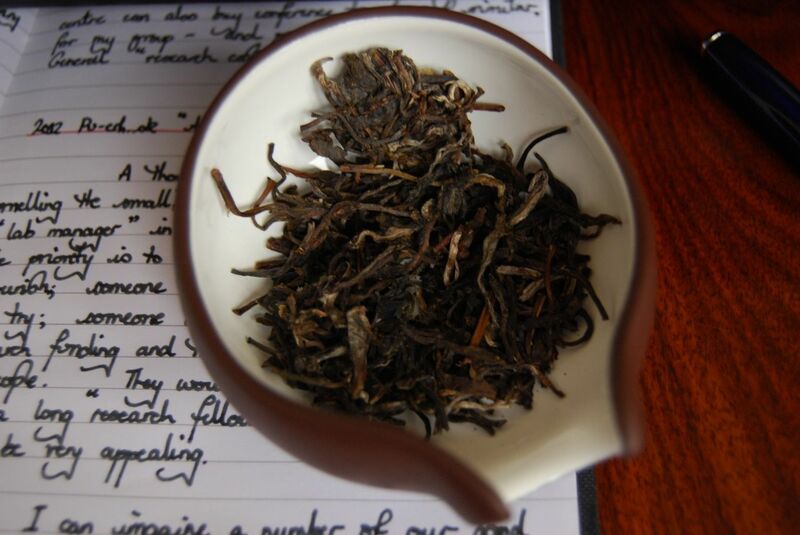 I see from its web-pages that Postcard Teas currently sells a pretty 2012 xiaobing for just £15, which seems potentially quite reasonable. I cannot determine whether or not this cake is the same genre as that sold by TeaHub under the same name. If you have any insight, gentle Reader, it would be most gratefully received. You may have concluded from the photography that this session started before the sun rose (hence the dodgy artificial lighting in the first image), proceeded through the dawn (in the second image), and concluded during the day (in the final image, accompanied by Xiaohu, my eldest son). 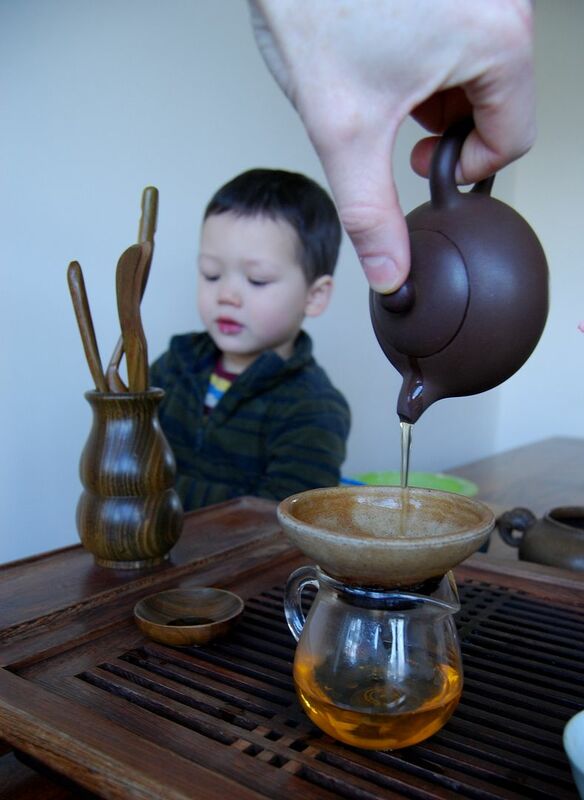 That is not to say that this tea lasted that entire time under continuous brewing, merely that a father's duties are many and that continuous time at the tea-table becomes less possible in a manner that is inversely proportional to the number of offspring that one has. The fragmented, small leaves are dark enough for a 2004 cake; the dry-scent of the leaves is unusually sweet - almost "cloying", as my notes have it. 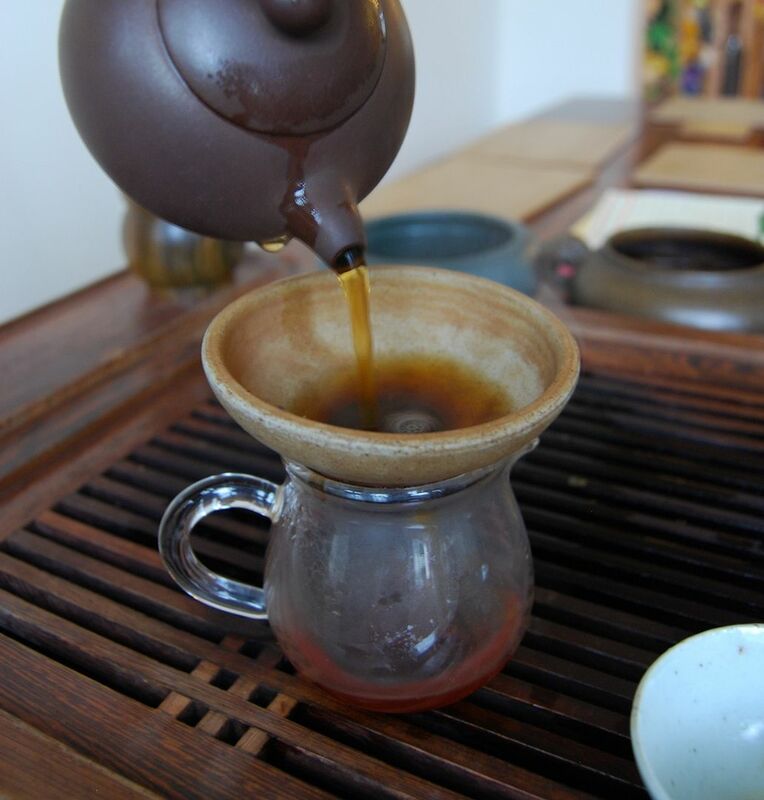 The resulting brews are clean and woody; there exists plenty of sweetness that penetrates into the deeper recesses of the mouth and throat, while the low soup has a reasonable thickness. 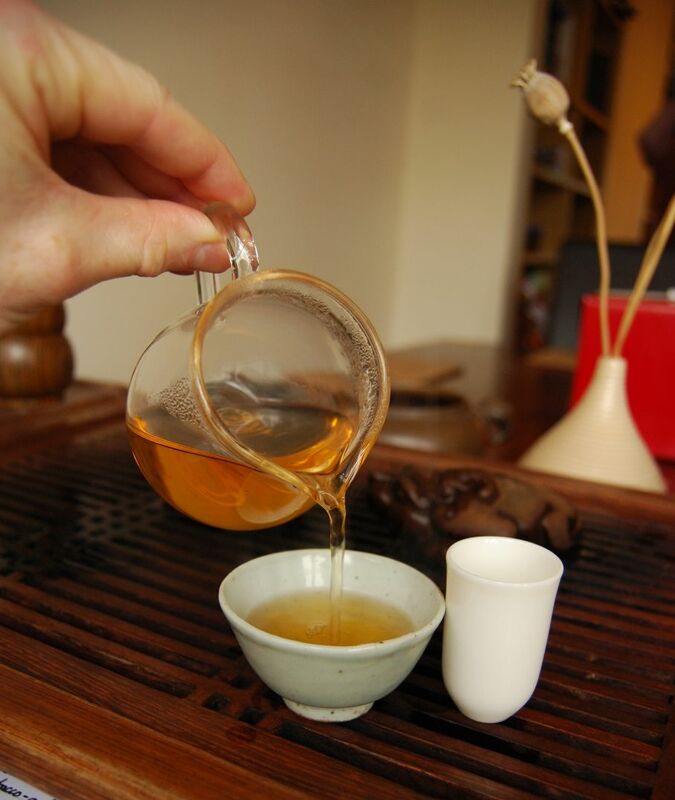 The "flavour" is not enormous, but the energetic effect of the tea is felt by the body immediately. Damo would be pleased indeed with the stimulating consequences that is has on the attention span. After a dozen infusions, this solid and respectable tea shows no sign of cracking. It remains heavy, low, chunky, and sweet. 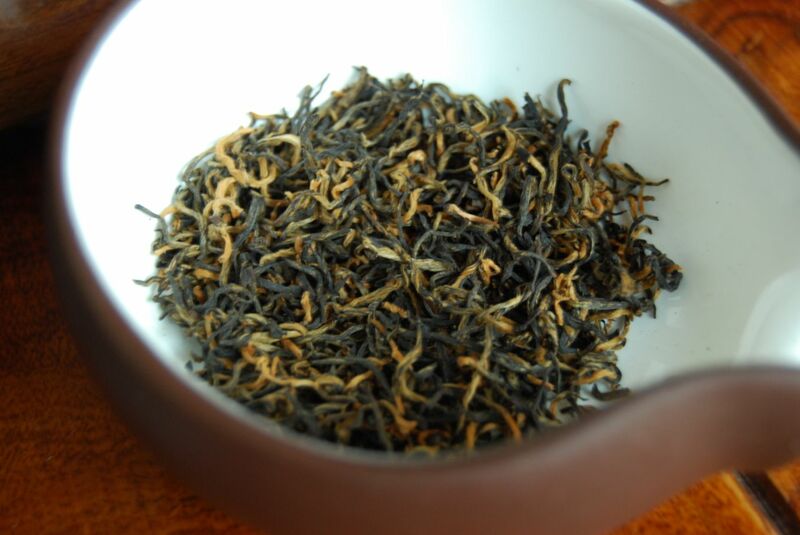 A rich tone begins to creep in underneath the constant sweetness after ten or so infusions, which is most welcome. I am quietly impressed, and am resolved to find my version of this cake for comparison. Thanks again to TG for the excellent, and enduring, session. I have no Fengqing [fung-ching] for years, and suddenly two crop up at once. 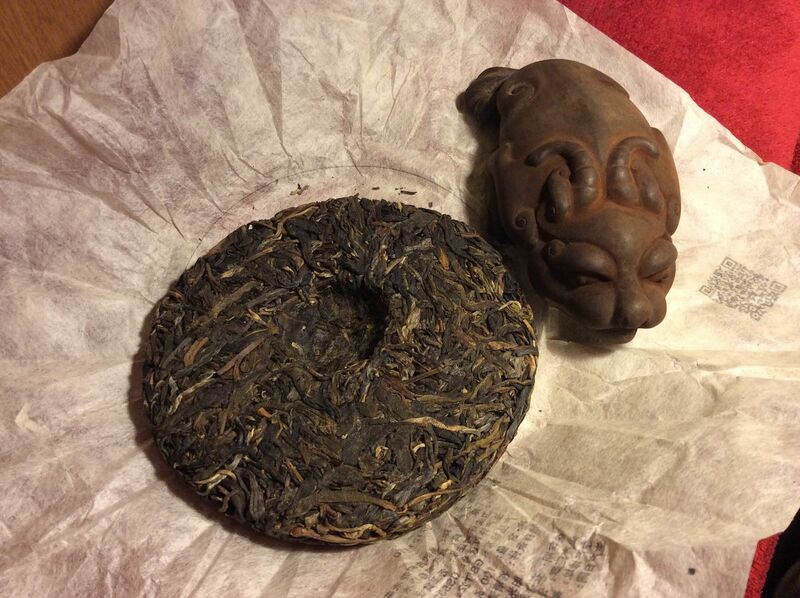 I recently enjoyed a 2002 Fengqing tuocha thanks to ME, and today is the turn of a 2005 zhuancha [brick tea], thanks to TeaVivre. Zhuancha is usually the rancid buttock of the pu'ercha world. If your tea is too unspeakably macabre to turn into a real cake, or even tuocha, then just collect as much leftover leaf as you can and chuck it into the brick-mould. Most bricks are really rather bad. Looking at the leaves used in this brick, we can see that there are, at least, one or two tips included and it's not made entirely out of fannings. Things are looking up. By the time the heavy, thick soup has revealed itself, I am beginning to wonder if this brick isn't something rather special. Let's examine the facts: it has a fresh, sweet scent when dry, and a pinelike woodiness when wet. 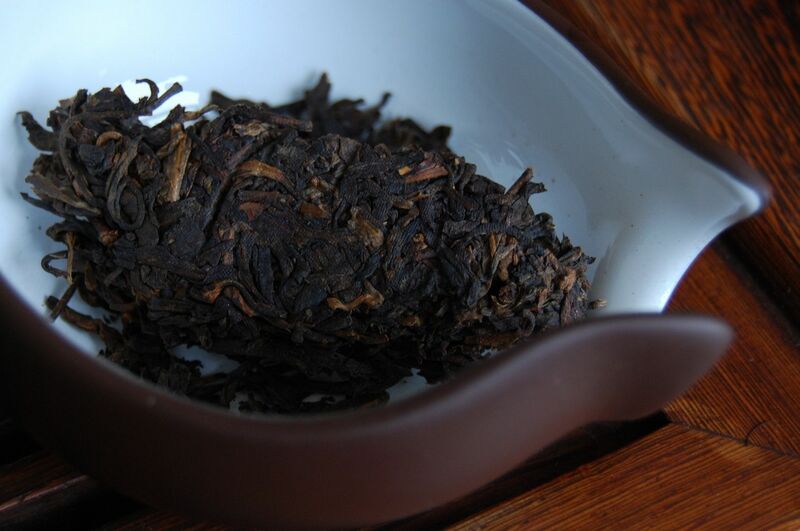 Its base is solid tobacco - not the "black" base of some modern Xiaguan, but getting towards it. 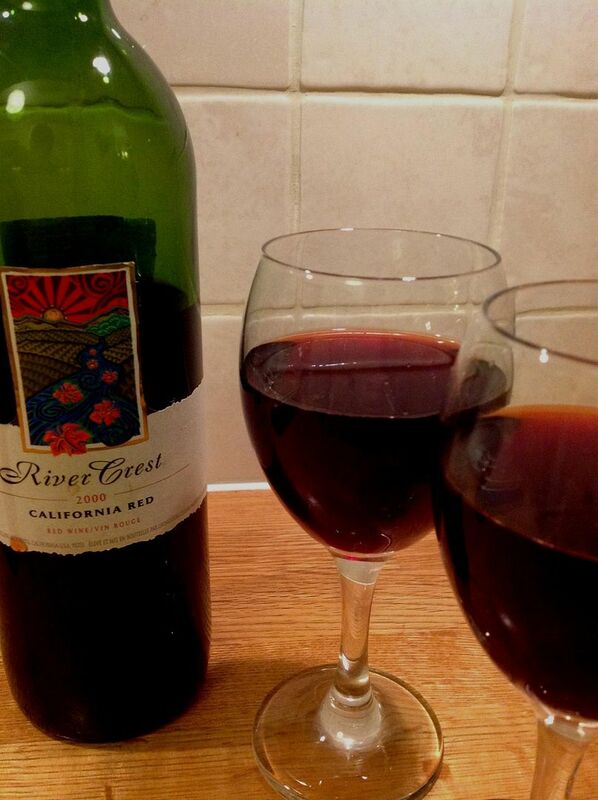 There is an agreeable thickness to its body, and even signs of a cooling character in its aftertaste. Its husky sweetness builds throughout subsequent infusions, along with a decent kuwei [good bitterness] that is neither too easygoing nor too harsh. 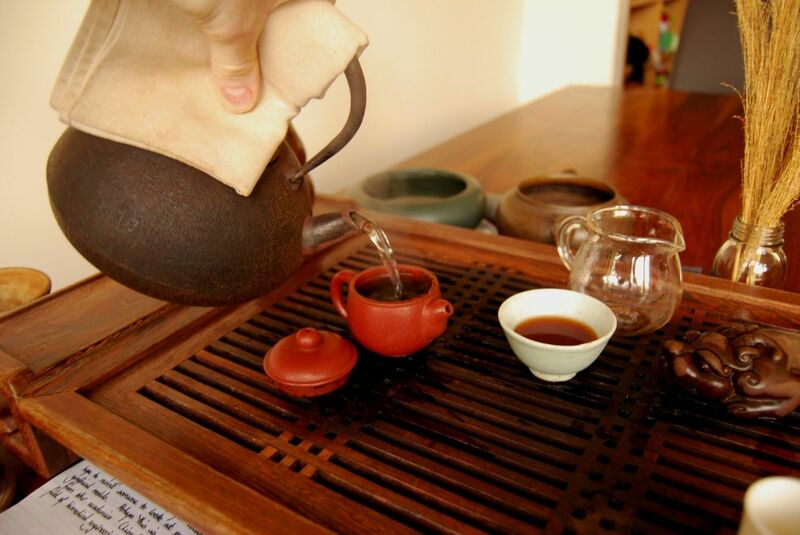 It is straightforward tea, but it is very reliable and brews consistently. Perhaps best of all, this little chap is a mere $26 / 250g. In light of its price, the bargain sensors are beginning to saturate. I should grab some of these for my lab - they have a challenge, and plenty of endurance. A surprise win. 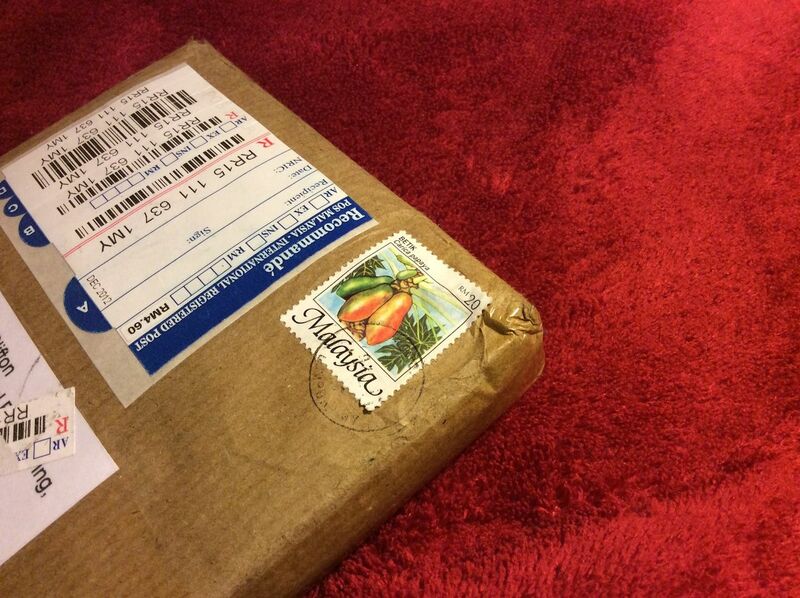 I love it when I get to my office and there's a parcel waiting. Who's this one from? While it transpires that there are actually six different teas in this pile, it is perhaps a sign of the times that I reach past the pu'ercha, for this first selection, and instead go straight for the hongcha. 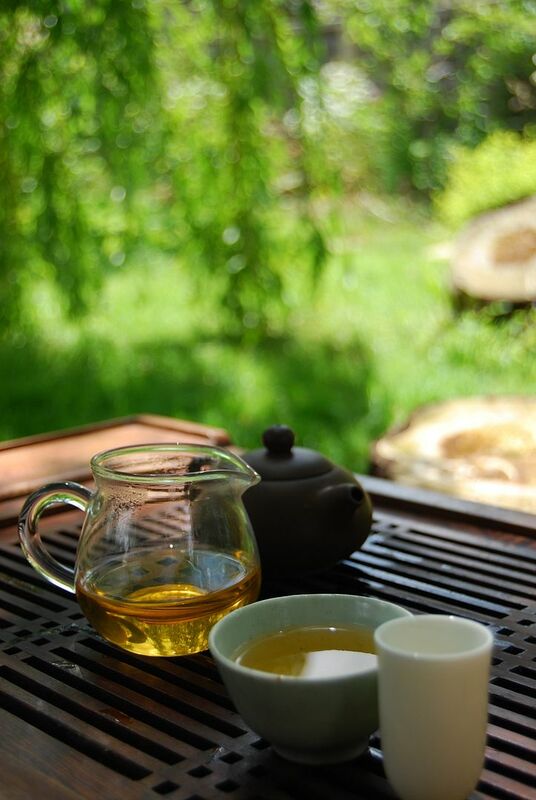 When it's cold outside, when it's been raining so much that the river has flooded, when it's daylight only for a small interval around noon, then you know that you need the warmth and comfort of solid hongcha. At least, that's how it works for your correspondent. "Jinsihuo" [jin-ser-hwo] literally means "gold-fur monkey". It isn't a type of tea that I have encountered before, although the mighty Babelcarp appears to have learned the phrase "Jinsiluo", referring to "gold-fur snail" (or "gold-thread snail") from the same area of Fuding in Fujian. 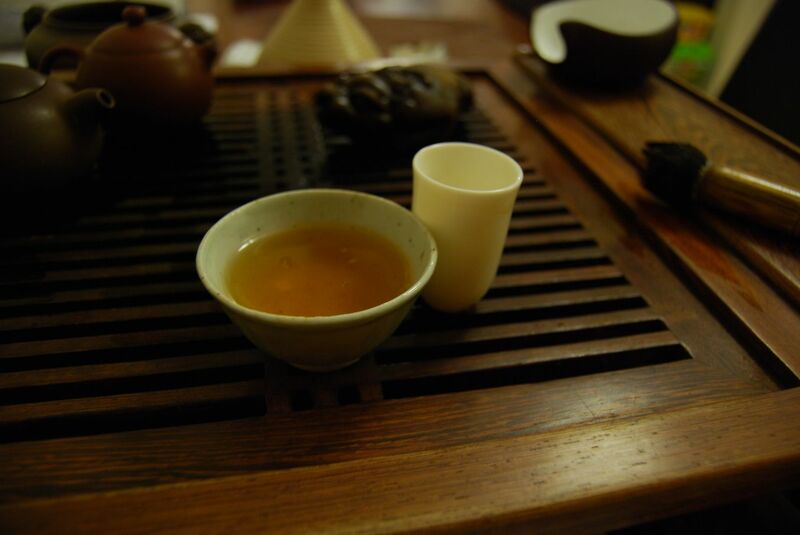 A quick glance at the photograph below will suggest why the "snail" name came to stick, perhaps because it is a hongcha version of Biluochun. 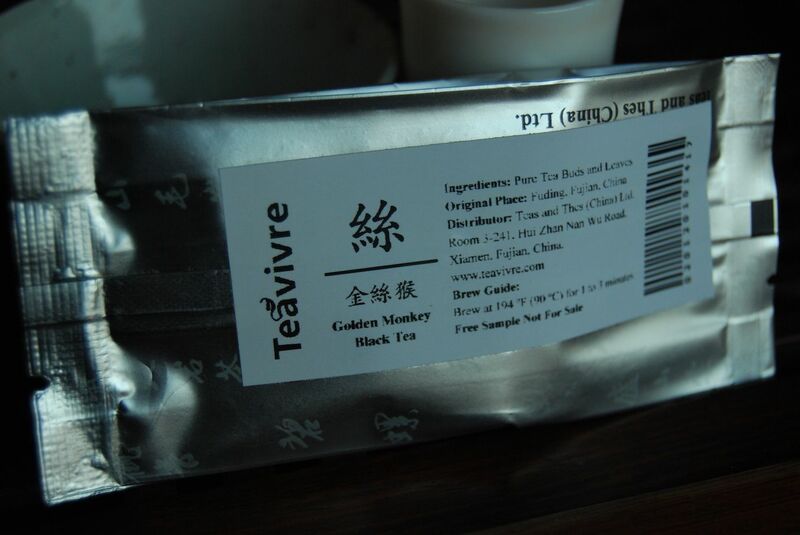 However, this tea is all about monkeys and not snails, and I respect that. 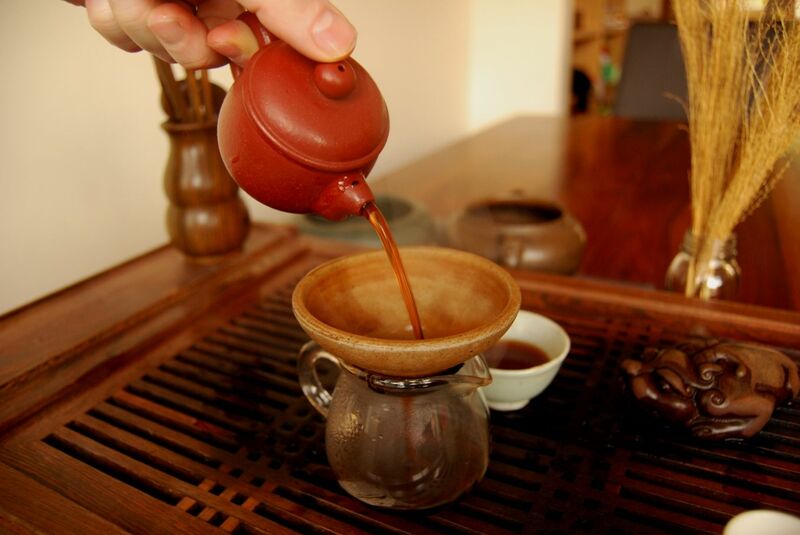 Many hongcha are simple. Some are complex. 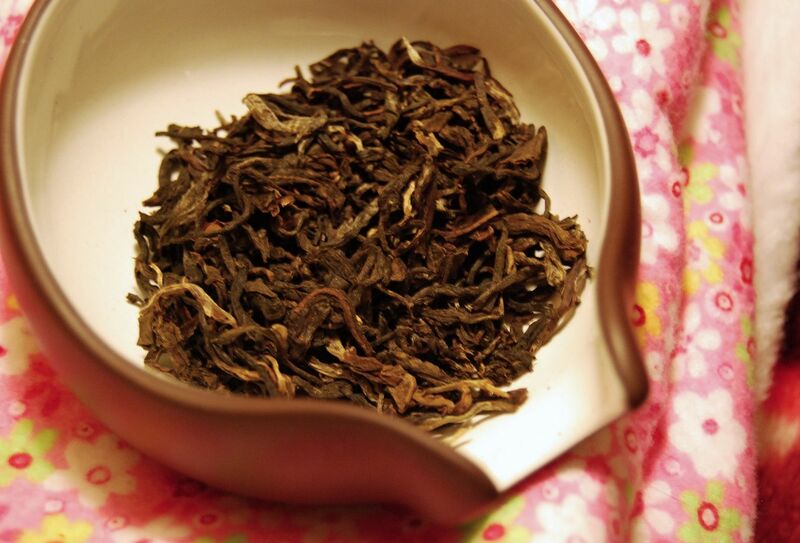 Some are porcelain elegances - I'm thinking of the canonical varieties sold by Essence of Tea, for example. It must be said that my favourite kind of hongcha is strong, potent, and uncompromising. I begin to wonder if the curly, fragile wisps of Jinsihuo can slice the Dijon. Fears of underpowered leaves are quickly dismissed in the first infusion. Due to the small size of the leaves, they rapidly give off their character, rather than the evolution that one might expect over several infusions from pu'ercha. These little fellows manage to pack a significant punch into that first infusion, which lasts well. It is a fine mixture of an excellent, traditionally-malted base, along with a tenacious sweetness, refusing to relinquish its hold on the tongue. The colour, as shown above, is likewise solid - it has the golden meniscus that provides good contrast, and where its body is fat, chunky, and very pleasant. This is a solid little hongcha, and I'm rather enjoying the session. 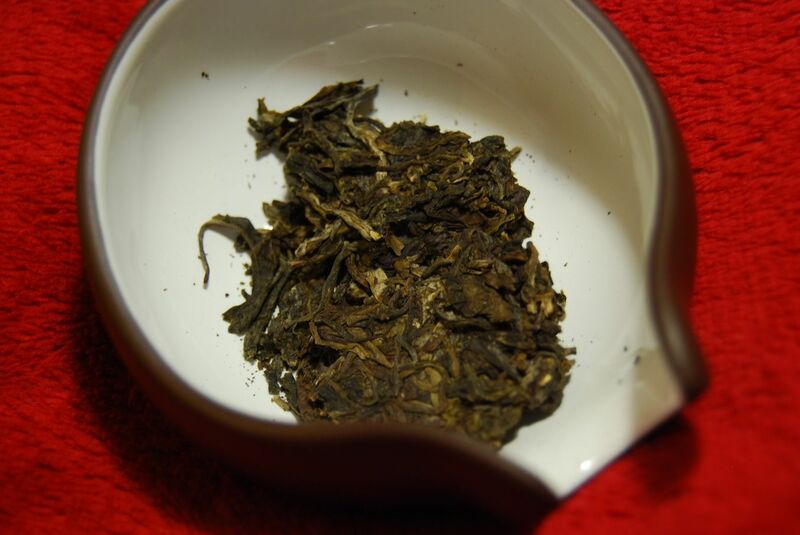 Perhaps next we should look at the price... $67 / 500g may seem, at first blush, quite a lot for hongcha, which is usually rock-bottom in price. 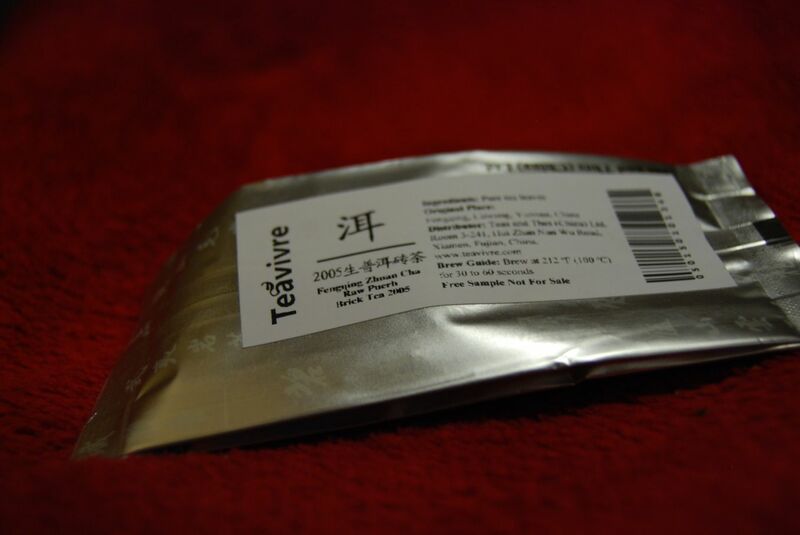 However, this tea comes with a chemical screening test from a reliable lab; if we accept that this tea is in fact similar to that which was used in the lab test, $67 for peace of mind is probably worthwhile. 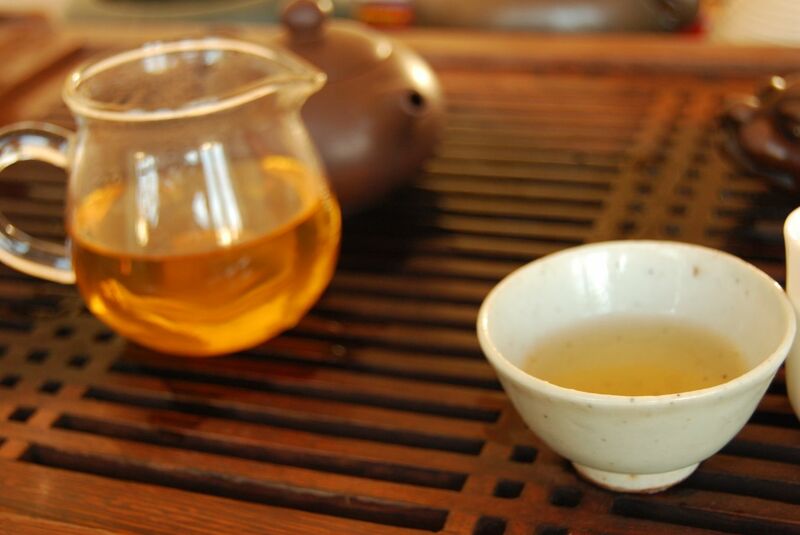 With hongcha, in particular, sharp practice including the use of nasty agrochemicals is standard practice. Thanks very much to TeaVivre for the session, which was a warming treat on a grim English day. Swapping tea with friends is a fine way to get taken by surprise. Today's session with a 2010 Gumingxiang is just such an exercise in unexpected, enjoyable pugilism. Thanks to ME of Argentina for this excellent session. 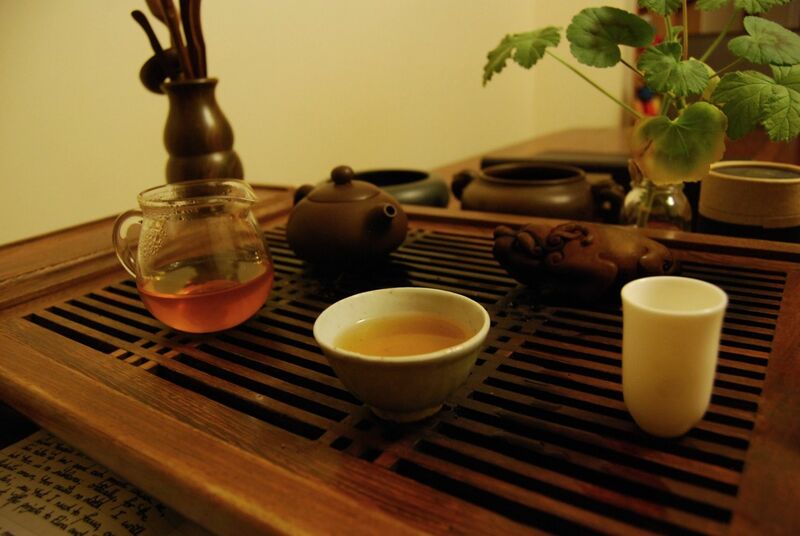 Although every tea is special in the Zen sense of living-everything-for-the-first-time, this session feels particularly significant. 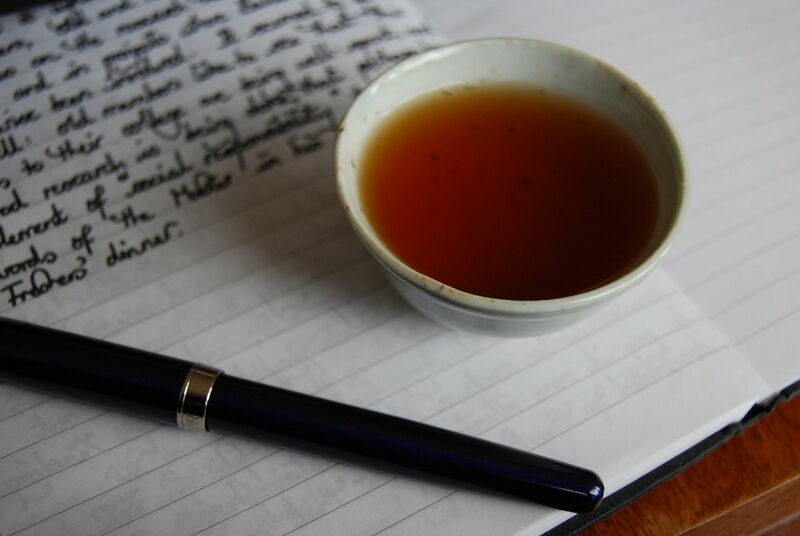 It has been some long weeks, at the time of writing, since I managed to reach my tea-table, and there is a layer of dust over everything that needs to be removed before the session begins. I use my bamboo brush to wipe away the residue. Already, I am in the mood for a serious tea. The scent of roasting dust rises from my hot-plate, beneath the tetsubin. Gumingxiang is not a company with which I have any past experience. 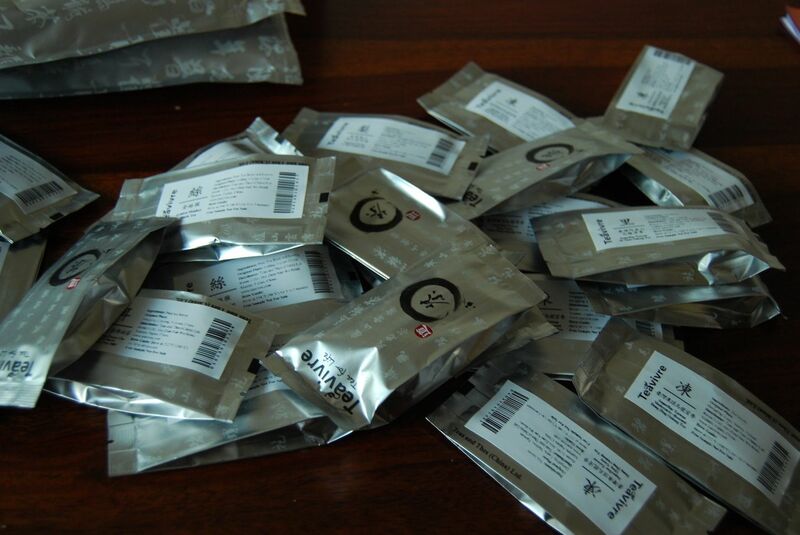 A quick Google search reveals that Yunnan Sourcing sells three cakes from this factory, and they are all from 2010. In order of increasing price, they are a Banpen, a Xinbanzhang, and a "Laobanzhang" ($40, $110, and $190, respectively). 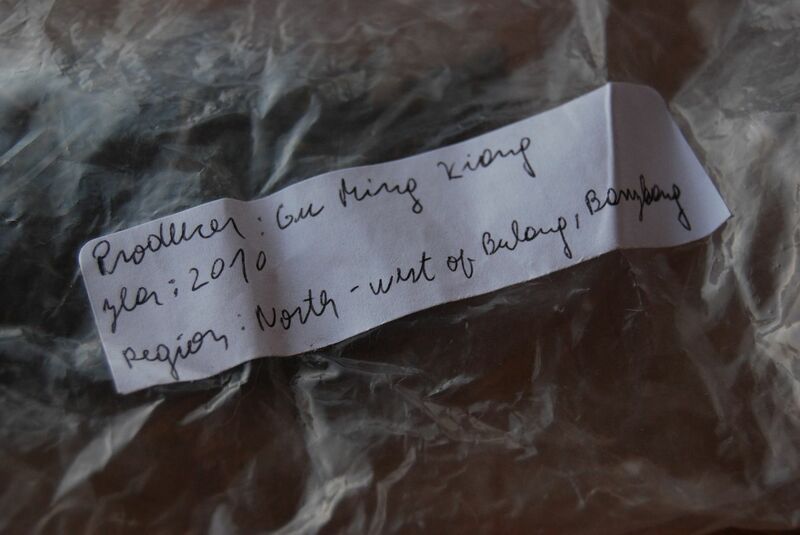 The hand-written labels notes that the leaves come from north-west of Banzhang. 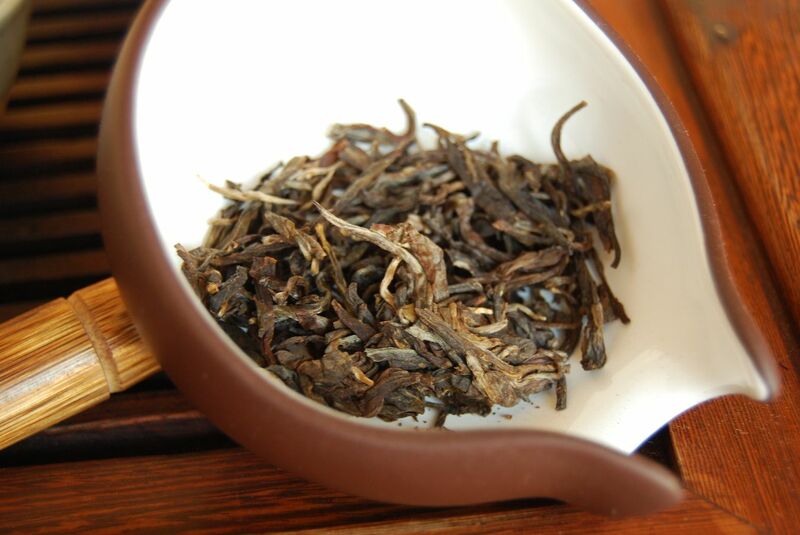 The maocha looks good, as you might agree from the photographs. The leaves have the colour of a few years of ageing, and are mostly unbroken. Their scent, appropriately enough, is "chenxiang" [aged scent] - given that the name of the company, Gumingxiang, is approximately "ancient tea scent". 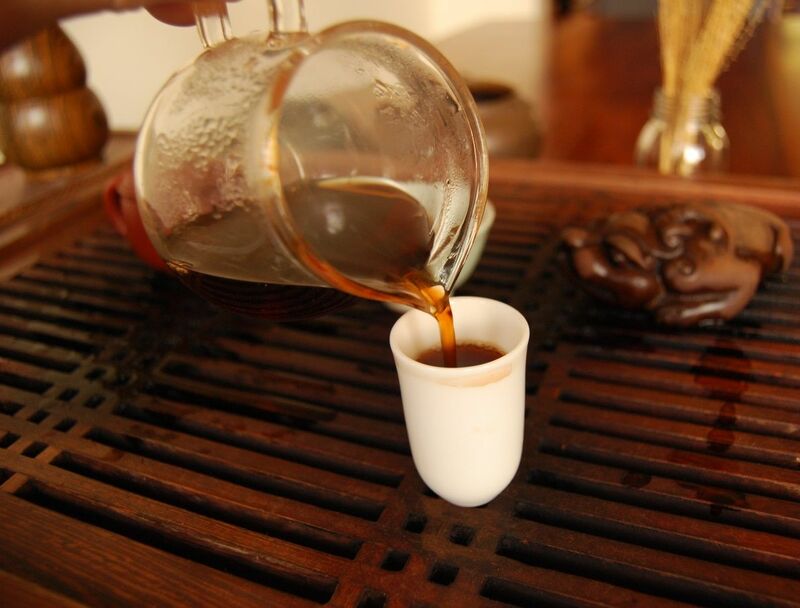 The aroma also carries the fruity, complex, low sweetness of its region, and I consequently hope for good things. This is dry (in the sense of a wine), husky, and instantly recognisable from its regional characteristics. The flavour is, for want of a better word, stunning: it is full-frontal tangy sweetness, with a fine undercurrent of kuwei [good bitterness]. This is by far the best tea that I have had in some time - but this must be taken in light of the fact that I have not had a real session for an absolute age. There is fullness, complexity, challenge, and aggressive charm. It is a fantastic tea with which to return to the table. This is not an "easy" drink: it rewards care in both preparation and consumption. I appreciate its heavy feeling that dominates the mouth, with a superb bitterness that exists tantalisingly close to the threshold that marks "unpleasantness", but which always remains on the side of "significantly enjoyable". Almost nasty, but not quite - this is good pu'ercha. 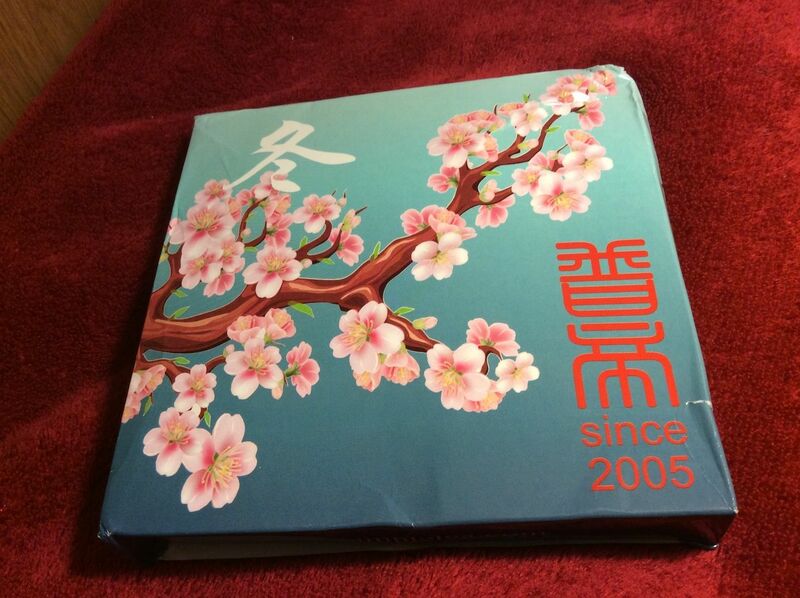 ...a fangcha [square-tea] in a similar manner to that from 2012. As you might decide for yourself from the images, this tea is already appealing, even from the wrapper. "The first bite is taken with the eye", it is said, and in this case, I am already nourished. I am a sucker for cherry blossom, it must be noted, and so I am hardly unbiased. Perhaps more importantly than judging this book by its cover, the tea is a "winter" concoction of leaves from... Luoshuidong. I cannot recall ever consciously enjoying a tea, knowing that it was from Luoshuidong, but there is a first time for everything. This particular region of Yiwushan is not closely correlated to amazing pu'ercha, in my limited experience. The characters that I could not read last year, and which are the name of the brand that SampleTea uses to mark its own tea, correspond to "Pudi". I think, if I'm not wrong, that the "pu" character is, of course, that of pu'ercha, while the "di" corresponds to the character used for "emperor", in the sense of "Qinshihuangdi". I therefore tentatively surmise that the name of the brand is "Tea Emperor", which rather reminds me of the humble, down-to-Earth (!) naming conventions employed by, among others, Sanhetang. 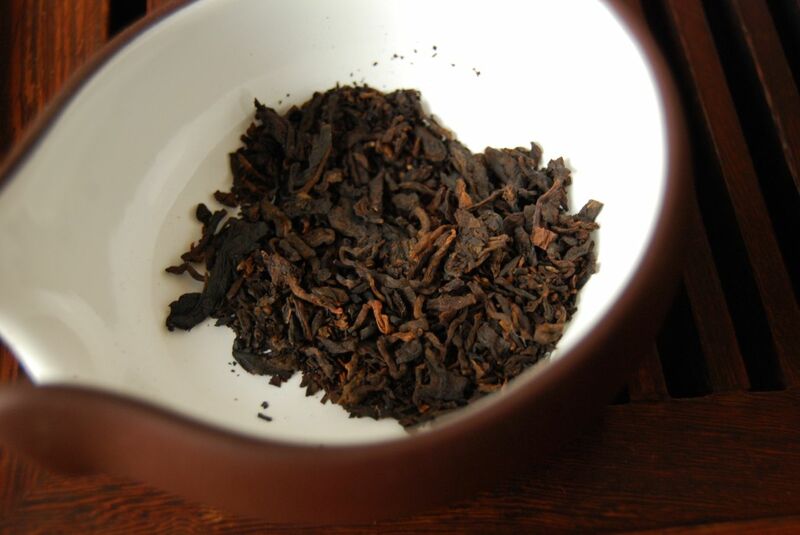 The name aside, this "2013 Yiwuzhengshan" cake is allegedly made from old-tree material, and the SampleTea web-site lists a 10g sample as costing $2.90, meaning that a full cake (at that price) would go for around $120, more or less. I imagine that the SampleTea model permits a customer to buy an actual cake at a lower price. Fluff aside, what say you about the tea? Well, it is pretty, to start with. The leaves look mostly whole, and the traditional stone compression is obvious. SampleTea notes that the leaves were sun-dried, which is something to be admired, given the modern trend towards using electrical driers. 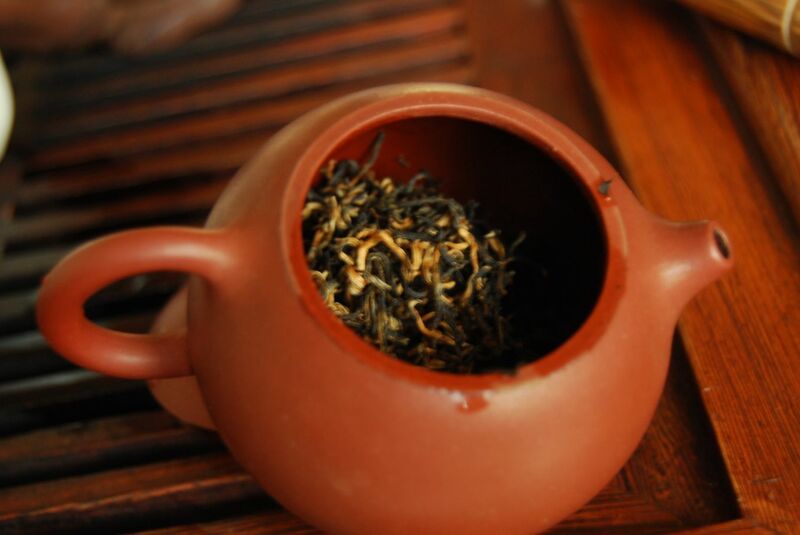 The tea itself has the expected yellow colour and consequent buttery-sweet scent. So far, so Yiwushan. 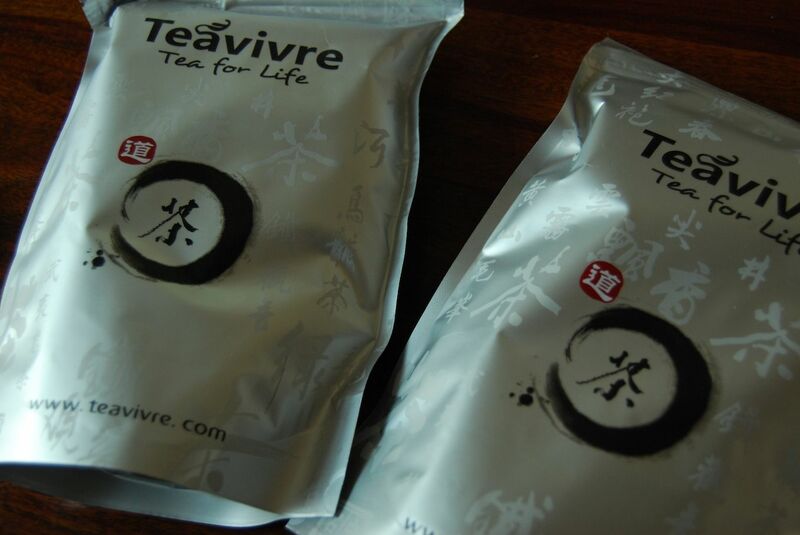 However, this tea really shines when it comes to its character in the mouth, and the effect that it has on the body. 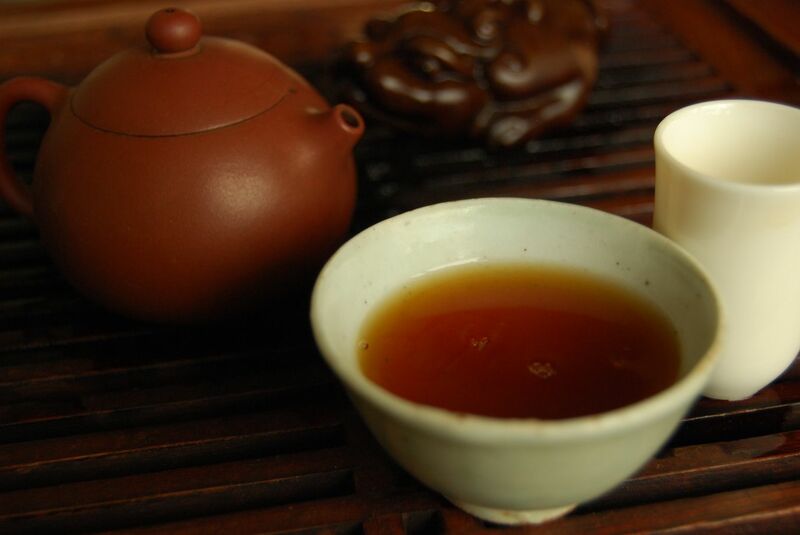 The long body of sweetness in the mouth is classical Yiwushan, and there is a surfeit of complexity in its base that constantly engages my attention. "There is much to impress in the first infusion", I noted during the session. 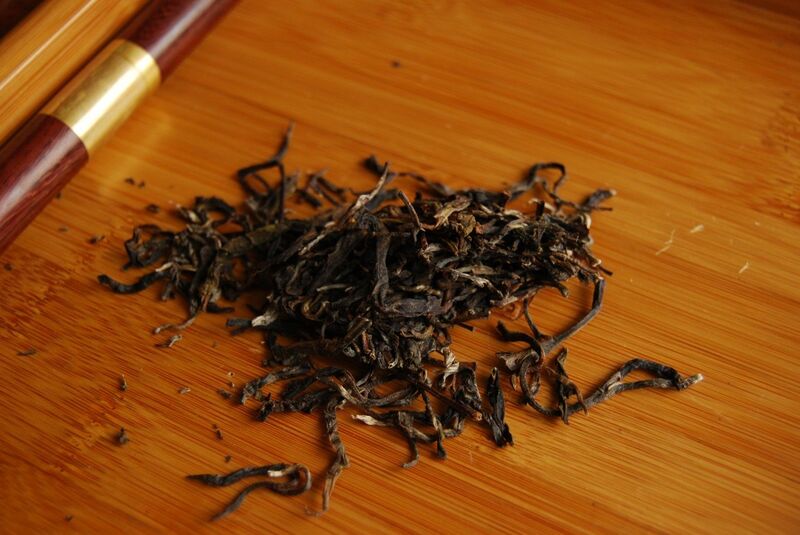 Everything that one might look for in Yiwushan tea is here, down to the chunky base of tobacco. The endurance is excellent; the feeling of comfort on the body is pronounced. Throughout the mouth is a solid, non-chemical sensation of proper cooling. It is a big tea that burrows under the tongue and refuses to budge. It may be, perhaps, that it is better in the first infusions than in the last, making it therefore better at the beginning than at the end - but that is true of us all, is it not? Thanks go to SampleTea for this delicious treat. The irony that I return to Oxford from Malaysia only to drink a tea that has recently been posted to me from Malaysia is not wasted on me. I have been thoroughly spoiled by Peter of Pu-ersh.sk of late, it seems, and this session marks the end of a string of delicious examples. 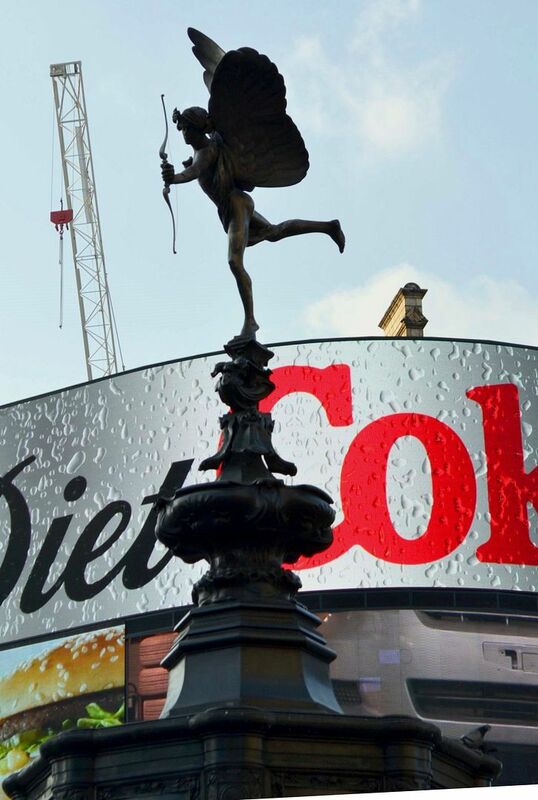 5g is not a lot of tea, but with the age of this old soul in mind, it is entirely appropriate. I am extremely grateful to Peter for the opportunity to try something so reverend. The tiny leaves, pictured below, are very "old fashioned". I mentioned recently that I have a small pot for those smaller samples of older tea that might arise, and this little fellow is pictured below. His name is General Zod. The General may be small, but he brews tea well. This may be because he only gets older samples to brew, but such selection bias aside, I find him to be thoroughly suited-for-purpose, which is the primary goal for me when buying a pot. The General has a particularly wide berth, as you might be able to tell from the photographs above and below: his opening is the width of his body, which makes him very sociable, and unlikely to damage the leaves. This is important in an old tea, though of course the tiny leaves of today's sample are unaffected by the width of the opening. General Zod also pours extremely quickly: he can eject his entire contents in a second or two, which is again a function of a pot that gets overlooked. I don't care if a pot dribbles, or looks silly, but I do want a pot to be able to eject tea promptly. Thanks to the small size of the fragments, even the first infusion is a plummy, purple shade. The character of the soup is fascinating: it is smooth, but not the "old library" that I was expecting. Instead, there is an edge that is actually rather sharp. The scent of the second infusion reminds of the old Chinese herbs that give Xiaohu's bedroom in our house its unique aroma. It is aged, but excellently poised between young and old. 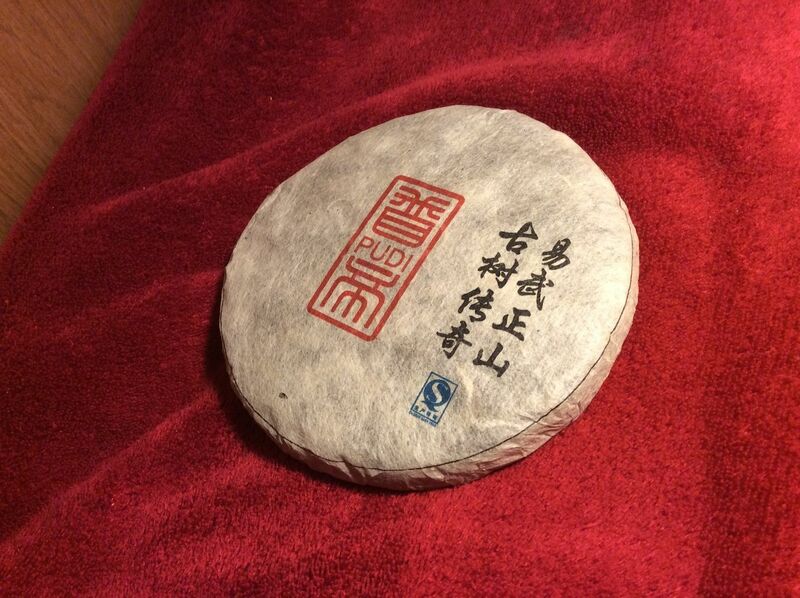 I am most impressed by a tuocha that has noticeably extended my understanding of "old tea". My journal records that "This tuocha is not the dusty old bookcase of a dilapidated, crumbling volume; rather, it is the sharpness of an aged textbook with sharp-yellow pages. 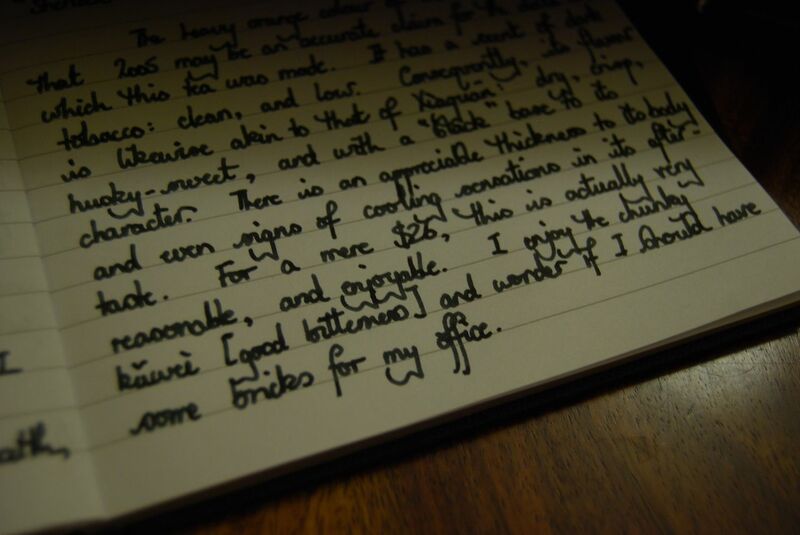 There is dust, but it is sharp and crisp, like those well-preserved and vivid pages in an aged textbook." The chaqi is startling: I am buzzing, though the quantity of leaves in the pot is small. Indeed, there is much to be discovered in this intriguing little fellow, and I am most grateful to Peter for the opportunity. The time before one's parents arriving is a special time. It is a time that flies past, hours spent like minutes, and yet it is a time to be treasured. 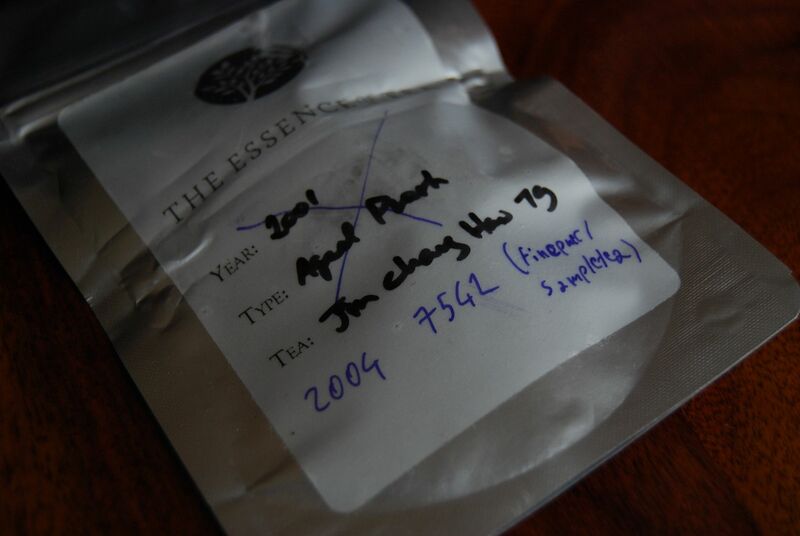 Before the Arrival on one particular Saturday, I sat down with the 2012 Autumnal Yiwu from Pu-erh.sk. It turned out to be the best decision that I made all day. The leaves are fruity and small, as pictured below. 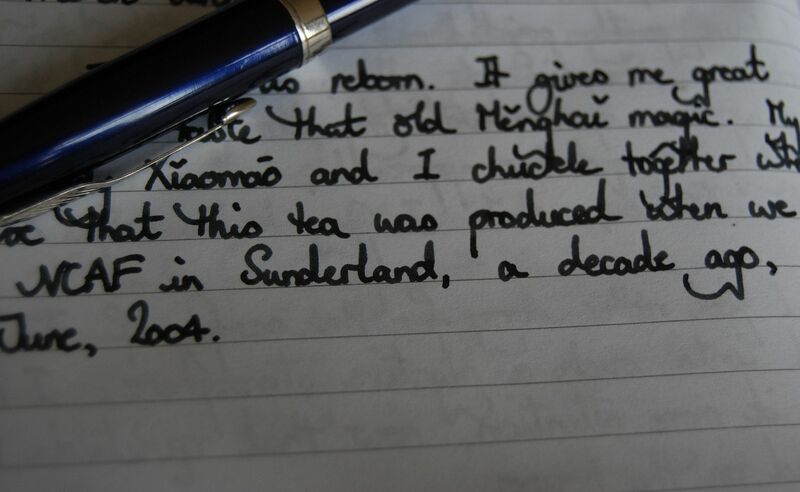 Oddly, it seems that I was making notes in my journal about the scent of this tea while planning the staffing of a new research centre in China. If indeed the proposed centre is built by my university, then I intend to ensure that my portion of it contains at least a representative quantity of pu'ercha for the researchers to keep their minds healthy. There's nothing like a good tea session to bring out the best in one's research - but maybe that's just me. Stocking such a place with an autumnal Yiwu might be a good idea: this cake combines the best of accessibility and high quality. It has a slightly brown hue that reminds me instantly of "guhua" [autumnal, lit. 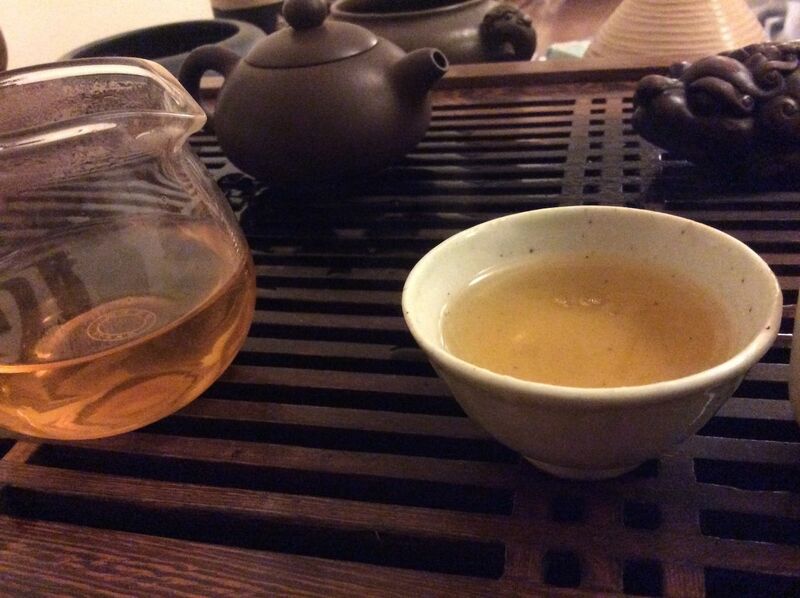 "grain flower"] teas, but it is truly lovely: sweet, clean, and very fresh. This range of characteristics is also true of the soup in the mouth, with its immediate buttery opening, its crisp profile that is easy to love, and its comfortable feeling at the back of the mouth. Just as the parentile units pull into the driveway, I come to the end of this memorable tea session. 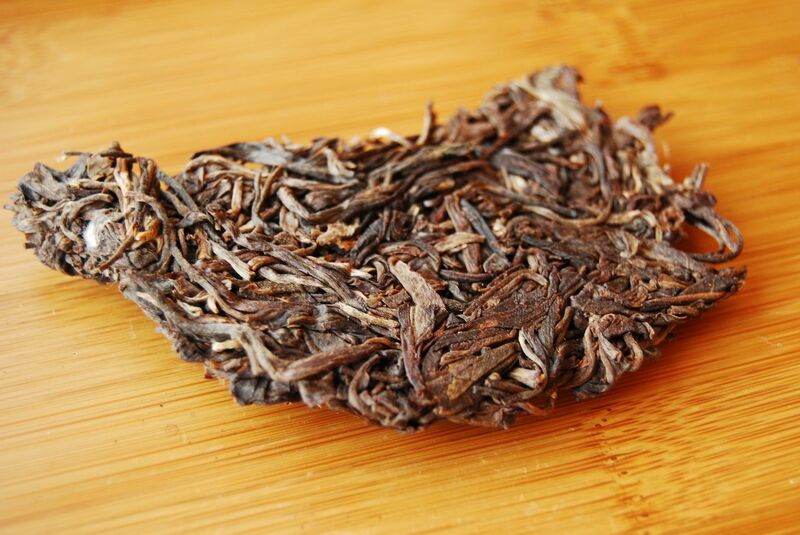 It is Yiwu in an obvious and enjoyable way: it has the low tobacco of much of the tea from that region, with piles of dry fruitiness on top, perhaps accentuated by its autumnal status. 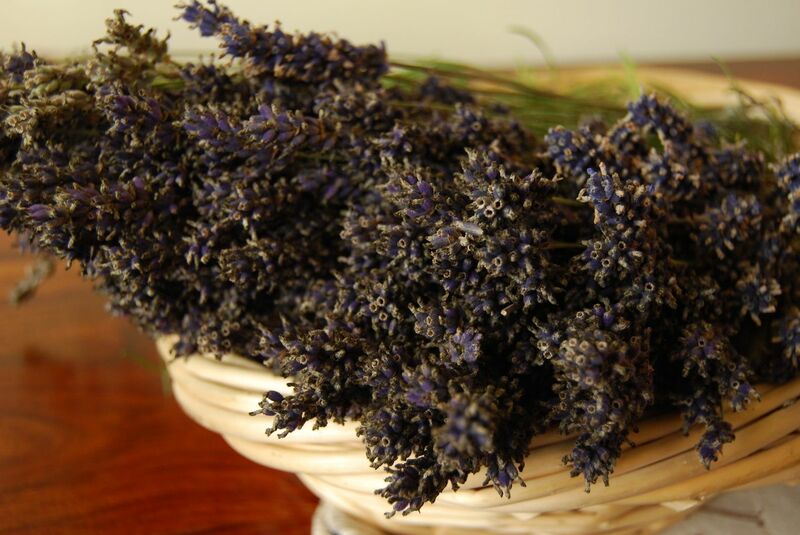 It is approachable, slightly "purple" in its flavour, and entirely rewarding.